If you would like to read the history and start from the beginning of these blog posts please see blog 1 of this series. We were walking around the property with the kids this evening and ran in to one of the sisters who owns the guest house. Sarah was teary telling us about a boy that she met this morning who was 6 years old and was not going to school. Sarah asked him why he did not go and he said he did not have the school fees to attend. (You hear of this often in the US…children not being able to afford school fees–we often wonder what that means?) Sarah said she was going to try to find the family to offer to pay his fees. A mere 5,000 shillings ($2.00) will cover a semester of the boys primary school fees. Sarah believes that by knowing the language and having an idea of where he lives–she is hopeful to find the family and offer to help pay the fees. We spent time with a pastor and his wife over lunch one of the first weeks we were in country. The time was pleasant and the conversation interesting. When discussing some of the most deep rooted problems that they have witnessed and walked through, the themes sounded incredibly familiar. (Though coming from two different sides of the coin so to speak.) The couple shared one of the most difficult issues that they find here is money. The pastor explained that he felt it important to teach: “Jesus is their Savior NOT MONEY.” It is almost laughable because no matter whether you are in a country that is wrecked by poverty and people have little to no income; or you are in a country that is “living the dream” and inundated with “stuff”–both see money in a similar vein. My friend Marce has taken several children to the hospital to check on medical conditions that they have. She explained that one must bring their own bedding, clothing, and food. Patients are expected to be cared for and attended to by their own families–changing the sheets, cleaning the clothing, and feeding their ill family members. She said in the courtyard of the clinic you can see people doing laundry and laying out clothes in the sun to dry. So what of those who are sick with no family? It leaves patients on the floor without blankets or beds. Here I see constant busyness. From well before the break of dawn until deep in to the dark people are working. They are fetching water–so that they can cook and feed their families. They are cleaning their homes, shacks, and 1 room spaces that are smaller than our smallest bedroom–that houses 4-8 people. They are driving bodas or fixing bodas, they are selling food or scavenging for it. (There are children constantly looking in the woods near our house for macadamia nuts to take to their families.) They are taking care of their livestock, milking cows (this happens twice a day here where we live), they are cleaning, selling, trading. Almost anywhere you go on the side of the road someone is selling something: vegetables, wood, charcoal, knock off crocks, huge chunks of beef, suit jackets, or samosas; all side by side in no particalar rhyme or reason except that it is a means by which people are trying to survive. I do not pretend to believe that everyone is insanely hard-working–and I know that there is plenty of corruption that pollutes the system and oppresses the people. But I do see a people that must work hard. Many many of them from sunrise to sunset. My friend Marce took a boy from a local orphanage to the doctor to get a diagnosis and prognosis on his condition. (She is volunteering there for 3 weeks.) He is 8 and from the time she arrives in the morning until about 2pm she said he sits on a potty. They do this because he is not able to walk, nor is he able to control his bowels. But Marce believes that he can to some extent, but they do not have the patience or “man power” to work with him on these issues nor the money for diapers to care for him on a regular basis. So this is the little boy’s daily life. Marce desired to hear from the doctor that there was hope but the doctor simply said, “there is nothing we can do.” He apparently has spinabifida and a few other things and had he had surgery early on he might be in a better spot–but now at age eight, things were not correctable–and this is now “his lot” in life. Marce was devastated and couldn’t imagine that this was it–no hope. In the West we feel like there has to be more options and Marce feels certain that in England (or the US) there would be more…but for this little boy here–this is life. So what do we do with this? No pretty bows to tie up at the end of her story or day. And so he sits…and she aches. Only one person in Fort Portal has begged or asked me for a hand out. Some have tried to sell me things at the market–“gold” frames or children’s shoes that they assumed we would like. But no one asked for money just because I was a mzungu or American. No one has begged for money except for one young man with the kindest eyes and sweetest smile I have ever seen. When I saw him I wondered if I wasn’t looking straight in to the face of Jesus? And then I saw his legs. Twisted and lame. I could not figure out how this man had gotten to the place where he was located–as no one was around to help him. And I could not imagine how he would get “home” if he had one. With no words he humbly gestured for a possible penny that I might share. If I had had my wallet it would have been emptied. Chris shared some shillings and we hopped in to the van. As we drove off out of the sight, all I could think was, “this man in this place has no hope for physical help.” There are no wheelchair ramps–if he had the money or ability to buy one. There was really no access or even side walks and roads without huge cracks and holes to navigate a chair. And if there was a way to “fix” his legs would there be any way to afford that type of surgery or rehabilitation–and would it be available in this part of Uganda? And so he sits. There is beauty beyond description. Land and soil rich and dark with loads of vegetation with incredible plant and animal life. There are avacados as big as egg plants and there are pineapples and mangos with the sweetest flavor I have ever tasted. There is a temperate climate that houses a perfect “harvest” all year long. Beauty and pain. Our planet is filled with beauty and pain. 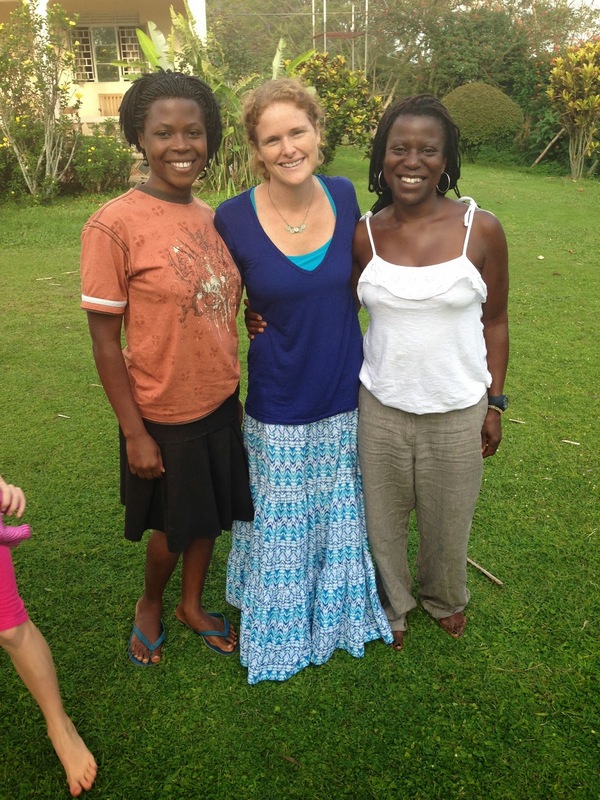 On the left is Karen who works at the guest house…and on the right is Marce my new British friend who is visiting Fort Portal and volunteering at a local orphanage…they both have become like family to our family! 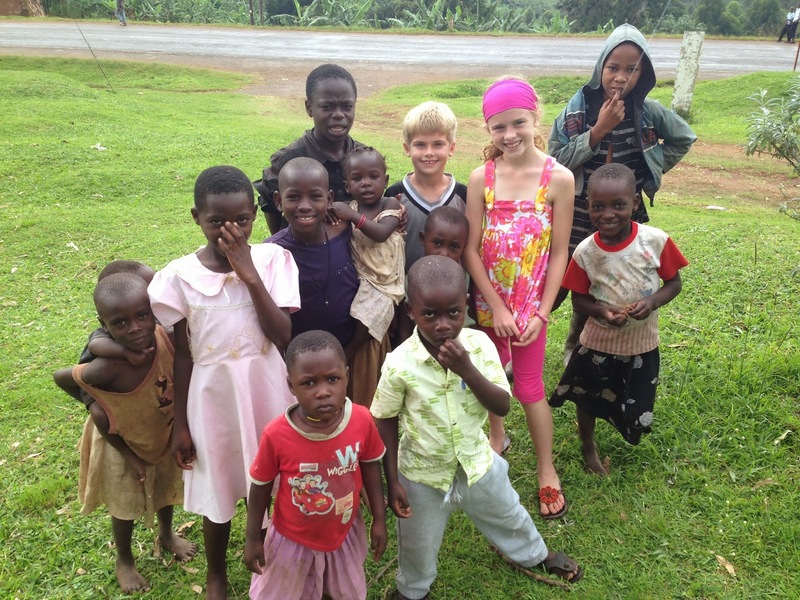 Caleb and Kylee with children who live at the bottom of the hill where we live. Amazed by the 7 year old and 9 year old who are never found without babies on their backs!